I hadn’t even heard a whisper about these tights which is unusual but here they are! 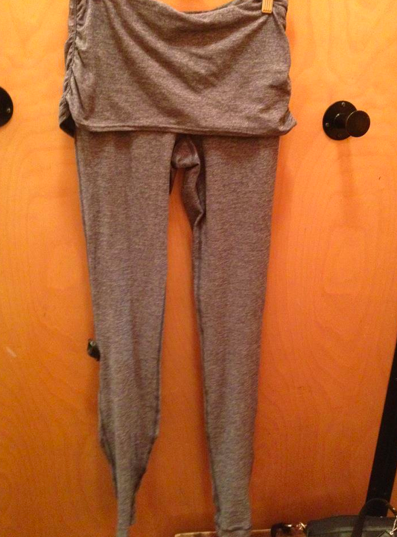 Chase Tights made out of running luon (dreamy! just like the inside of the Dog Runners) with a fold over waist. Aimee, who posted this picture took a pass on them because of a seam detail at the back of the leg, but she otherwise loved them. Price is $98 and the fold over panel can cover about 3/4 of said ‘not small’ bum. "Heathered Black Swan Cool Racerback Tank!" I love this! Is this pic from a Canadian store or US? That's my photo — yeah! 🙂 The correct name is "Chasse Tight" (think dance step). I'm pretty sure the color is Heathered Coal, but I didn't look at the tag carefully. If this came in maybe a Heathered Black, I would reconsider it.